Posted on February 24, 2017 by admin wrote in News. NEW YORK, Feb. 24, 2017 – Drexel Hamilton, LLC President James Cahill was recognized as a Patriotic Employer by the Department of Defense and Employer Support of the Guard and Reserve (ESGR) Mr. Cahill and the firm were recognized for their efforts to hire and train veterans with a service-related disability for a career in financial services. 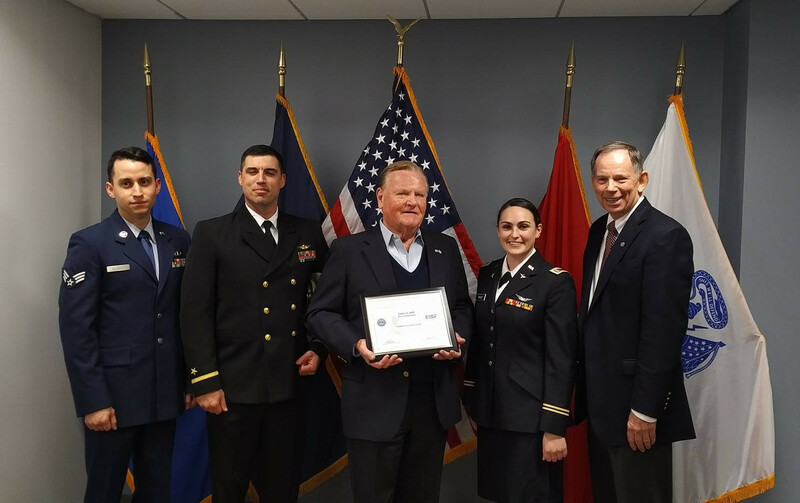 Referred to as the “Patriot Award,” the recognition is bestowed by the DOD on employers for contributing to national security and protecting liberty and freedom by supporting employee participation in America’s National Guard and Reserve force. “We’re proud of this recognition and hope it serves to encourage all employers in any business venture to hire our returning veterans and give them a chance to re-enter the work force,” said Cahill. Drexel Hamilton has hired more than 80 veterans since its founding in 2007, more than half of whom are recognized as Service-Disabled Veterans by the Department of Veterans Affairs. A number of the firm’s employees remain active in the National Guard and Reserve forces. Cahill said that Doll, himself a Service Disabled Veteran and two-time Purple Heart recipient, remains committed to hiring additional veterans returning from Iraq and Afghanistan. With more than 100 professionals, including 42 military veterans, 22 of whom are Service-Disabled, Drexel Hamilton has offices in Philadelphia, New York, Chicago, Jacksonville, Dallas, Milwaukee, Lincoln, San Francisco, Detroit, Atlanta, Orlando, and Nashville. The Patriot Award reflects the efforts made to support citizen warriors through a wide-range of measures, including flexible schedules, time off prior to and after deployment, caring for families, and granting leaves of absence if needed. Only an employee serving in the National Guard or Reserve or the spouse of a Guard or Reserve member may nominate individual supervisors and bosses for support provided directly to the nominating Service member. ESGR, a Department of Defense program, was established in 1972 to promote cooperation and understanding between Reserve Component Service members and their civilian employers and to assist in the resolution of conflicts arising from an employee’s military commitment. ESGR is supported by a network of more than 4,500 volunteers in 54 committees located across all 50 states, the District of Columbia, Guam-CNMI (Commonwealth of the Northern Mariana Islands), Puerto Rico, and the U.S. Virgin Islands. Volunteers, hailing from small business and industry, government, education, and prior military service bring a vast wealth of experience to assist in serving employers, Service members, and their families. Together with Headquarters ESGR staff and a small cadre of support staff for each State Committee, volunteers work to promote and enhance employer support for military service in the Guard and Reserve.